A Chilean-led expedition to explore the ocean trench off it’s own coast succeeded in launching and recovering a benthic lander named DOV Audacia (Audacity), three times to deeper than 8,000 meters, the last to a record depth of 8,081 meters deep. 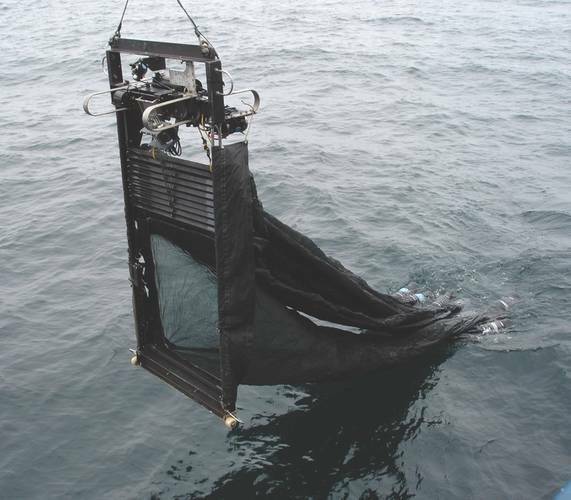 Using a Mocness Trawl the expedition also collected plankton at a record depth of 5,000 meters. 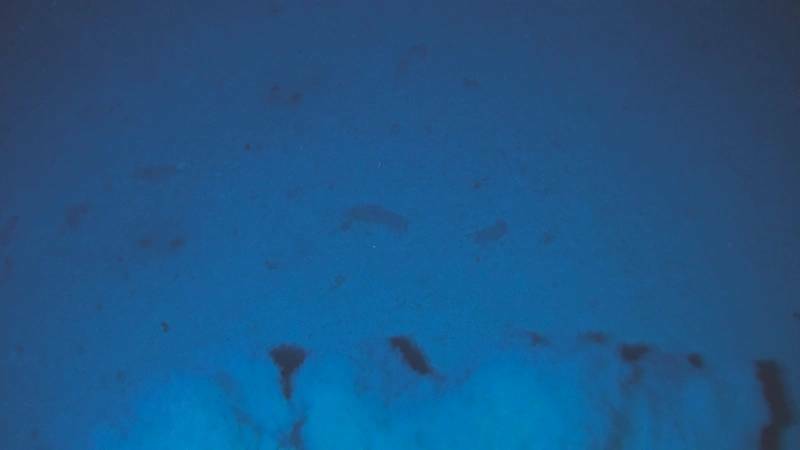 The Atacamex 2018 expedition represent a milestone for marine science in Chile, as researchers there pursue seminal work in deep-sea exploration and research. The hadal zone is the deepest region of the ocean, from 6,000 to 11,000 meters below sea level. Their access and study is extremely difficult due to the high pressures and great difficulties of reaching these depths. For these reasons, not for lack of interest, this area has remained practically unexplored. The hadal zone comprises more than a score of trenches, many forming the Pacific Ring of Fire, where the Earth swallows part of its crust due to the sinking of one tectonic plate under another, giving rise to island chains and mountainous areas such as the Andes. Ocean trenches can erupt unexpectedly in intense seismic activity, producing shattering tremors and destructive tsunamis. Along the west coast of South America lies the Peru-Chile (Atacama) Trench, the longest of the planet, with a maximum depth estimated by sound of 8,065 meters, making it the tenth deepest trench in the world. This past 25 January – 02 February 2018, on the Atacamex 2018 Expedition, Chilean investigators from the Instituto Milenio de Oceanografía (IMO-Chile), led by Professor and Institute Director Osvaldo Ulloa, made the first observations and gathered samples from the absolute deepest depths, 8,081m in the Atacama Trench. The Chilean scientific vessel Cabo de Hornos, operated by the Chilean Armada, was the surface support ship. Achieving the historic exploration first required finding a way other than the massive winch and long wire normally used to plumb the hadal depths. Instead, the reseachers relied on the design and construction of a custom hadal-class free vehicle, a benthic lander. Made from modern materials, the high-tech, and compact autonomous deep-ocean vehicle was designed and built by Global Ocean Design (San Diego, CA). Dr. Ulloa named his benthic lander “Audacia” (Audacity), to recognize the boldness and fearlessness needed to challenge an unexplored frontier. The benthic lander “Audacia” is 96”/244cm tall x 25”/64cm wide (49”/125mm wide with the side variable flotation pods) x 21”/53cm deep, with an weight of approximately 400-lbs/182kg. In water, the lander was trimmed to float like a spar buoy with 40-lbs of positive buoyancy. An expendable anchor weighing 80-lbs/36kg, took the lander to the bottom at about 1m/sec rate. Lateral offset by a surface current would not have much affect. If a surface current were 100m thick, the lander would blow through it in 1min 40 sec. The benthic lander “Audacia” was designed and built by Kevin Hardy, Global Ocean Design (San Diego, CA), a world expert in the design and construction of deep-sea hadal landers for exploration. It utilized components from a number of international companies. The benthic lander made three dives during the Atacamex 2018 expedition, all of them to depths of over 8,000 meters. After anchor release, it returned to the surface close to the point of deployment. Demonstrating the use of highly adaptable benthic landers, allowing increased exploration of the deep ocean at a lower total cost. The benthic lander is an untethered free vehicle, meaning once it is over the side, all physical connection to the ship is severed. The ability of the lander to transit down and back is based on controlling density in accordance with Archimedes’ Principle: if the lander is heavier than seawater it sinks, if it’s lighter, it floats. An expendable anchor provides the negative weight to sink, fixed flotation provides the displacement to float back to the surface once the anchor is released. Benthic landers are the most cost-effective way to get to mid-water or benthic locations. They can carry traps, samplers, and sensors. They can travel to any depth, and remain for short periods of time to multiple years. Landers can be released with countdown timers, acoustic command, galvanic time releases (GTR), or by a pre-programmed event trigger. Operations may be conducted on smaller charter vessels from ports close to the site of interest, freeing researchers from the significant cost and scheduling issues of dedicated oceanographic vessels. Some are small enough to be lifted with one hand from the ocean, but strong enough to journey to the bottom of any ocean trench. Expanding uses include exploration, science, research, and environmental monitoring. They can be deployed singlely, or in large numbers to survey a large area from a small vessel. Once the lander is deployed, it is free of the ship, while at the same time the ship is free if the lander. Landers can be configured to communicate with each other, or with a surface platform such as an oil platform. Many of the same sciences proposed using the cable-to-shore OOS networks can be done with benthic landers, with the limitation that data is not available 24/7. Devices designed for mating to the OOS can be qualified using landers. Deployment of DOV Audacia utilized a crane, taglines, and a quick release. Upon return to the surface, a pair of Zodiacs pulled the lander to the ship, Cabo de Hornos, where a sling was attached to hoist the lander back on-board using the crane. The lander was secured in a vertical orientation so both sides of the lander were accesible for sample removal and data download. The buoyancy budget is managed by use of plastics over metal for the frame and side panels. Two 17” borosilicate glass spheres (Nautilus Marine Service, Buxtehude, DE) provide both flotation and housings, and are lighter than syntactic. Through-hull adapter fittings and vacuum/purge ports in the glass were provided by Global Ocean Design. Underwater connectors were provided by MacArtney/SubConn. Pairs of 10” flotation spheres, rated to 10km depth, added one to each side up to a maximum of 8, provide variable buoyancy of up to 72lbs/33kg. The 10” spheres may also provide auxillary instrument spheres for guest researchers who wish to “catch a ride” on the Chilean lander. A ballast weight tray at the bottom provides convenient attachment of trim weights. A 40-kg anchor weight pulls the benthic lander to the seafloor. 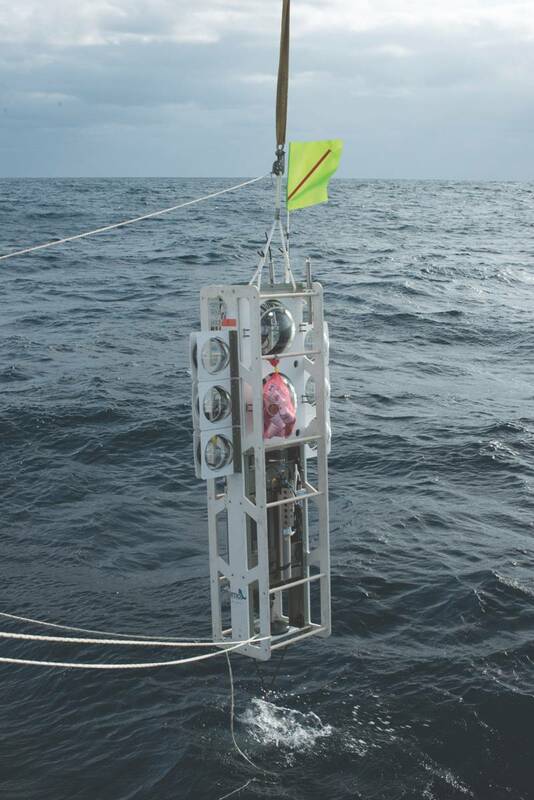 To rise, the anchor is released by either the BART acoustic command system (EdgeTech, West Wareham, MA) or a back-up countdown timer (Global Ocean Design). The EdgeTech BART board developed for this mission features 2 burnwires, and three additional commands, all of which could likewise be converted to burnwires. Radio Direction Finding (RDF) and strobe recovery beacons were made by Xeos (Dartmouth, NS, CAN). These worked very well. A custom GPS beacon board (Global Ocean Design) and interior LED strobe, worked well. Satelitte covereage in the southern hemisphere slowed the rate of determining true position transmitted to the ship. Chilean researchers requested twin 30-liter water samplers be included on their lander for microbial studies. These were provided by Ocean Test Equipment (Miami, FL). The tiny “Duet” P/T sensor (RBR, Ottawa, ON, CAN) worked very well to maximum depth, providing a cross-check to the main Sea-Bird sensor, as requested by the Chilan reserchers. 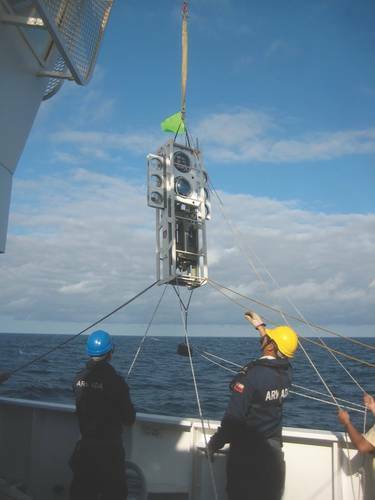 A Deep 19 CTD with DO sensor (Sea-Bird Scientific, Bellevue, WA) was the primary sensor package preferred by the Chilean scientists. The CTD sensors worked flawlessly to full trench depth, while the DO sensor did not work below 1500m. The self-recording underwater video camera was developed for this project by SubAqua Imaging (San Diego, CA), and Pisces Design (La Jolla, CA). The 14.8vdc/32Ah battery pod with internal BMS to power the LEDs worked well (Global Ocean Design). The pressure compensated LED lights have some improvement needed to function more reliably. 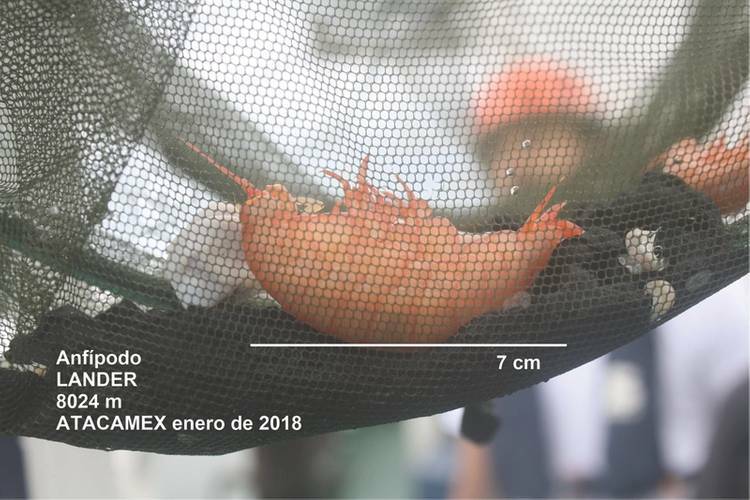 With the trench so close to the shore, Hadal Explorer James Cameron, who stayed in touch with the expedition, surmised that gigantism might be observed among the Atacama Trench benthic amphipods. 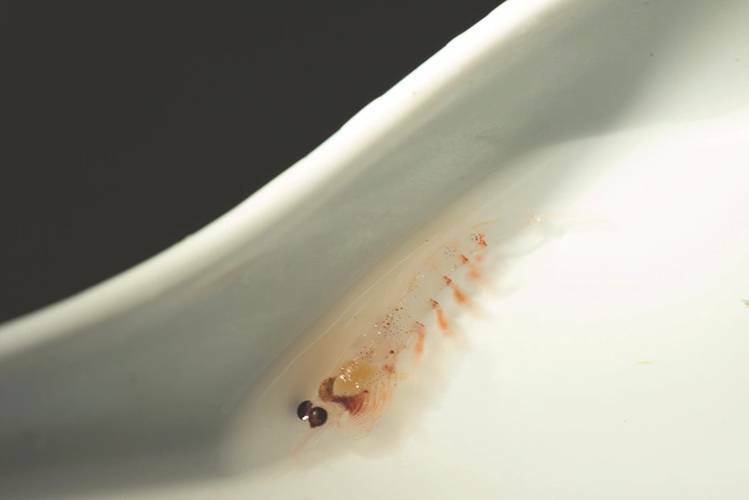 Samples of large amphipods were indeed captured in baited traps. Benthic landers allow any institution or agency of any size, in any country, the opportunity to explore their own seas to any depth they’d like, from the shallow continental shelf to the ocean trench floor, for a time period of their choosing. It’s disputive technology that empowers everyone. Along with the benthic lander “Audacia”, the Atacamex expedition utilized other latest-generation equipment: the Mocness (short for “Multiple Opening and Closing Net, with an Environmental Sensing System”), a large plankton net with different compartments that open and close through an electroacoustic mechanism, permitting the collection of samples at different depths (Biological Environmental Sampling Systems (BESS), N. Falmouth, MA). 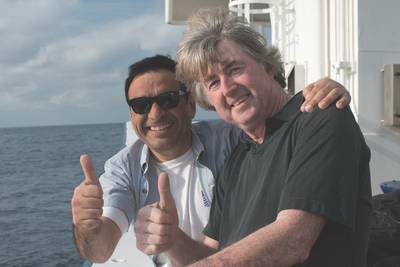 Erich Horgan (BESS) and Dr. Rubén Escribano reported another historic world record for this region of the ocean, “obtaining, for the first time, samples of plankton from a depth of 5,000 meters.” The Mocness, the only one of its kind in the Southern Cone of the South American continent, collected a large quantity of new deep-sea organisms, including fish, which will now be studied in the IMO laboratories for identification and better understanding of their biology. From the Chilean Navy research vessel AGS-61 Cabo de Hornos, Dr. Osvaldo Ulloa, Atacamex 2018’s lead scientist, declared that “we achieved repeated access to the bottom of the trench, to an even greater depth than reported, and from there we were able to collect water, organisms, images, and hydrographic information. The possibilities of putting sensors, to carry out —for example—seismological or current measurements, are there. With that, we’re pointing to the path to bring about a national, multidisciplinary program for the exploration and scientific study of the Atacama Trench. 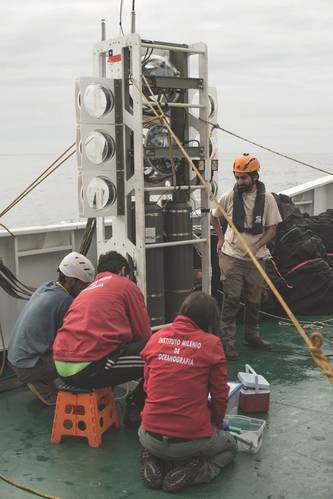 The oceanographic investigation, whose participants include researchers from Universidad de Concepción, the Pontifical Catholic University of Chile, and Universidad de Antofagasta, is being carried out thanks to the support of the Millennium Science Initiative (ICM), the National Commission for Scientific and Technological Research (CONICYT), the Chilean Navy, and private parties. Kevin Hardy (right), founded Global Ocean Design LLC after retiring from the Scripps Institution of Oceanography. He previously designed and built the landers for James Cameron’s DEEPSEA CHALLENGE Expedition. Dr. Osvaldo Ulloa, (left) is Profesor Titular, Departamento de Oceanografía, Universidad de Concepción, Director of the Instituto Milenio de Oceanografía (IMO-Chile), and lead scientist of the ATACAMEX 2018 expedition.